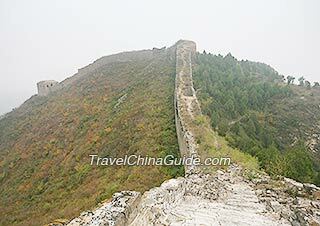 Jiangjunguan Great Wall is 30 kilometers (20 miles) northeast away from Pinggu District of Beijing. To get there, you may take subway line 2 or 13 to Dongzhimen, and change to bus 852 or 918 to the terminal, Pinggu Qichezhan Station. Then transfer to Pinggu bus no. 29 to the scenic area directly. You will see the square base of the former gate tower of Jiangjunguan when you get off the bus. Firstly, it is suggested you climb onto the tower from the southern gate to overlook the surrounding rolling mountains with remaining ramparts built along the ranges. After that, walk through the nearby Jiangjunguan Old Village and then follow a stretch of asphalt road to the foot of the mountains to start your adventure. When the whole day's hiking is over, reverse the trip back to Beijing. Jiangjunguan, meaning General's Pass in Chinese, is the easternmost section of Beijing Great Wall and the only remaining Great Wall section of the city that was laid of stones. It was firstly built in 1404, joining Huangsongyu Great Wall on the west and Huangyaguan Great Wall of Tianjin on the east. There used to be a 3-storey gate tower but only a 6-meter (20-foot) high foundation is still remained. Behind the tower is a giant pillar-shape rock named General Stone with a height of about 10 meters (30 feet), after which this section was named. Residences there are in their original appearance and only a few people still live there at present. Bricks, stones, and tiles are common constructional materials and some houses were even built of stones dug from the Great Wall ramparts, so the major tone of the village is earthy yellow, endowing this place with a beauty of primitiveness. Walking in the village might make you feel like being dragged back to the old times. 1. As a one-way trip from downtown Beijing to the scenic area would take about 5h, you are suggested to arrive at Dongzhimen before 7:00 to take bus 852 or 918. 2. When the hiking is over, reach the Jiangjunguan Bus Stop at 15:30 to catch the last return bus no. 29. 3. 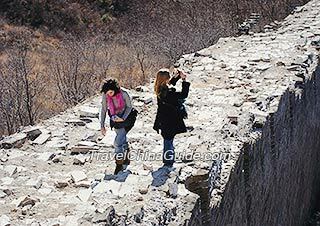 Jiangjunguan is a section of the Wild Great Wall of Beijing, without good protection and renovation, so there is no booth or facilities like cable car or elevator. We suggest you pack some snacks and bottled water to help your maintain your strength. 4. Some ramparts are severely damaged and are so narrow that can only allow one person to go through at a time, so make sure you wear hiking boots and take alpenstock. Besides, watch your step during the hiking. 5. Jiangjunguan New Village is 1,100 meters (1,200 yards) south of the scenic area. Some of the farmhouses there can provide meal and accommodation services for backpackers. You might want to taste some farm-flavored dishes there, such as stewed chicken with mushroom and millet pancakes, and have a rest before going back to downtown Beijing.